If you are in charge of hosting Christmas dinner than styling the perfect dining room is crucial. 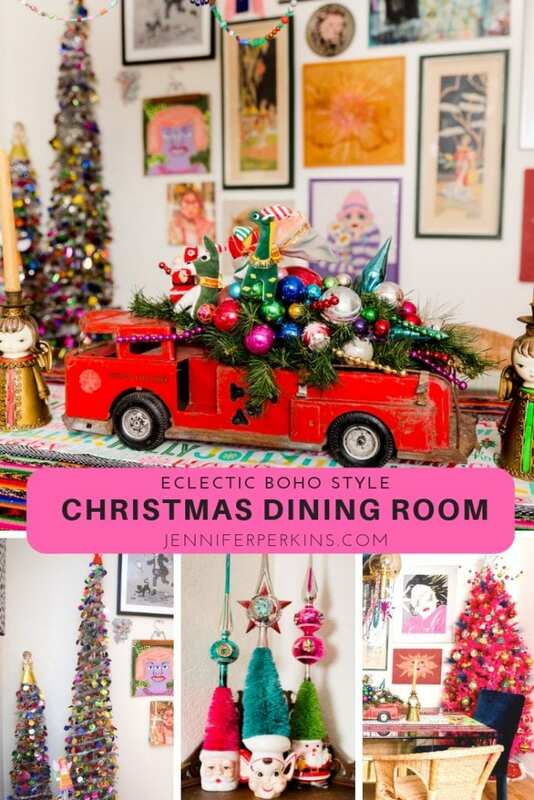 This year in the dining room I went with an eclectic boho Christmas vibe where new meets vintage holiday decor. 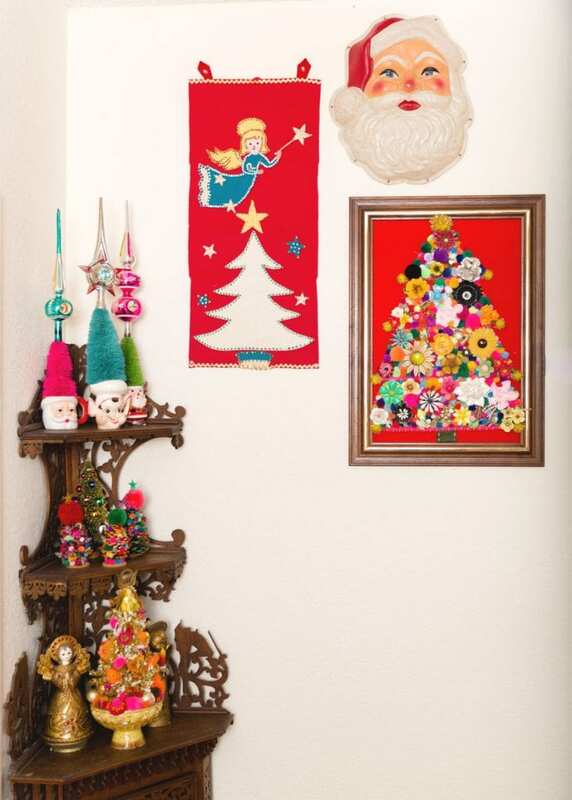 Layers of patterns in exotic prints and kitschy holiday felts join forces. 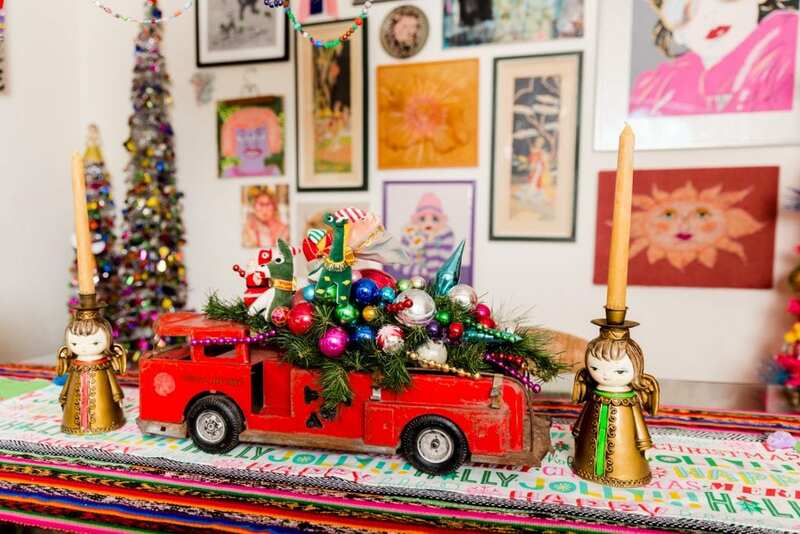 Collections of vintage beaded ornaments, antique fire truck centerpieces and 60’s paper mache candle holders all mingle getting ready for that holiday jingle! Usually my dining room table is covered in mail, backpacks and bags from the thrift store. However, when it comes to decorating this is also the first room you see when you walk in the house. Even if I have never eaten a single meal sitting at this table I try to keep it cute for the holidays. My mother who I inherited all my crafty skills from made this vintage firetruck turned Christmas table centerpiece. It always sat in her kitchen and now it sits in the center of my dining room table bookended by a pair of groovy 60’s angel candle holders. Pro-Tip: I LOVE a giant DIY centerpiece more than most, but remember you want to be able to see over to interact with family and guests. 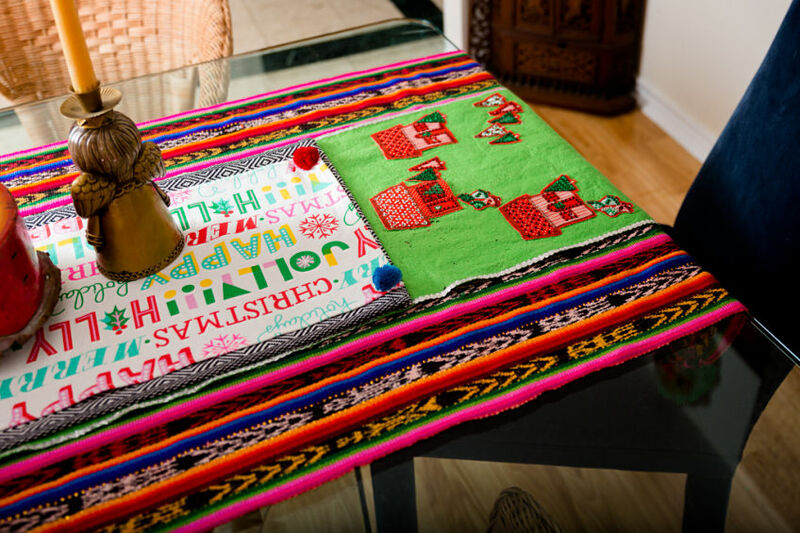 Yup, there are 4 table runners in this picture and I’m not ashamed to admit it. I love layering, mixing patterns and combing new and vintage pieces. The long colorful piece was thrifted, the black and white pattern is new, the Christmas writing is a Target Dollar Spot special and the green felt with sequins was made by my grandmother for my mom. Fun, festive and sentimental all in one! 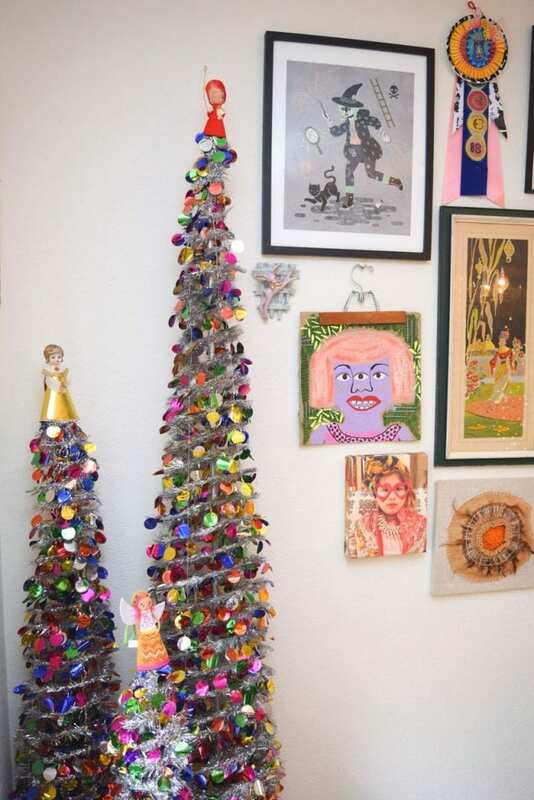 These collapsable sequin trees come in tons of different sizes and colors. I know because I own one of each. 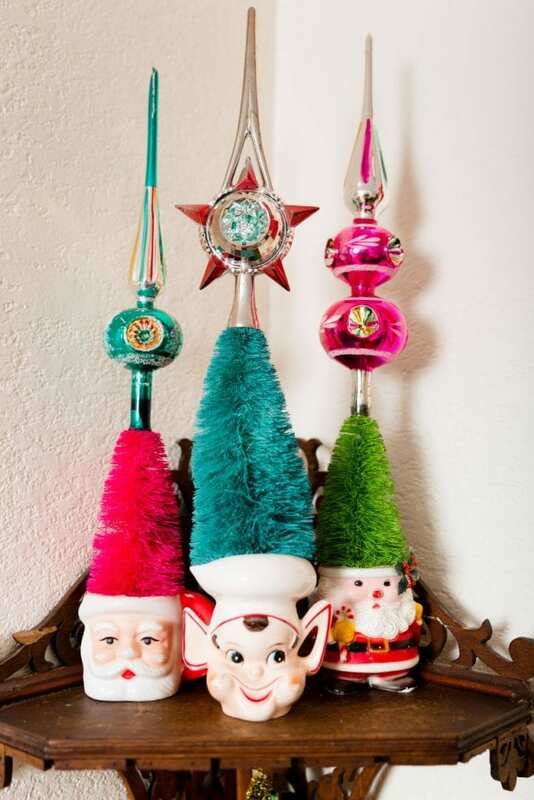 Keep up the mix and match theme by topping them off with some vintage angel tree toppers. P.S. Want some of your own Jennifer Perkins Art for your gallery wall? We can make that happen. 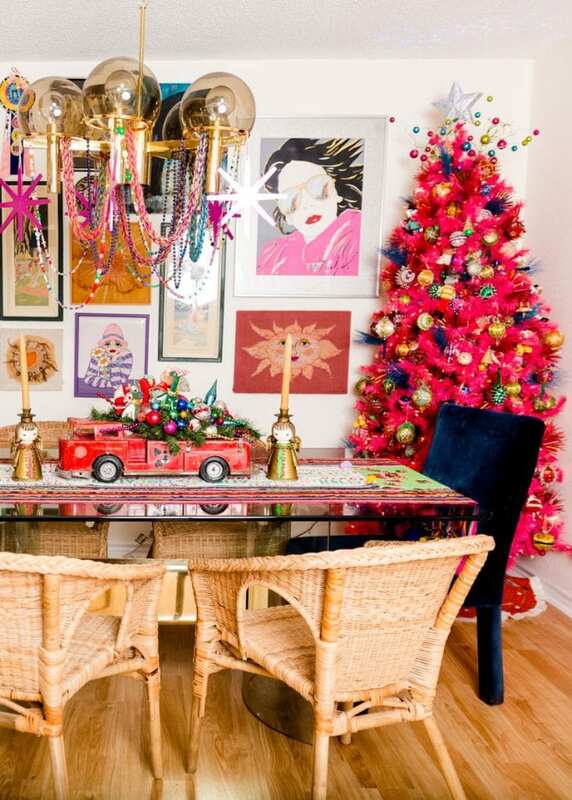 There is always room for a Christmas tree (or two) in the corners of your dining room. As long as everyone can get around comfortably to their chairs you are golden. 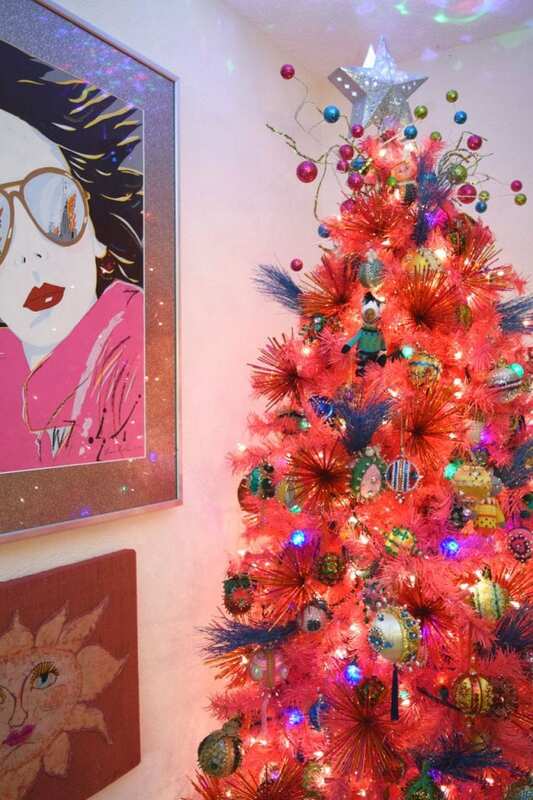 My hot pink Christmas tree is not a true corner tree, but it works! P.S. 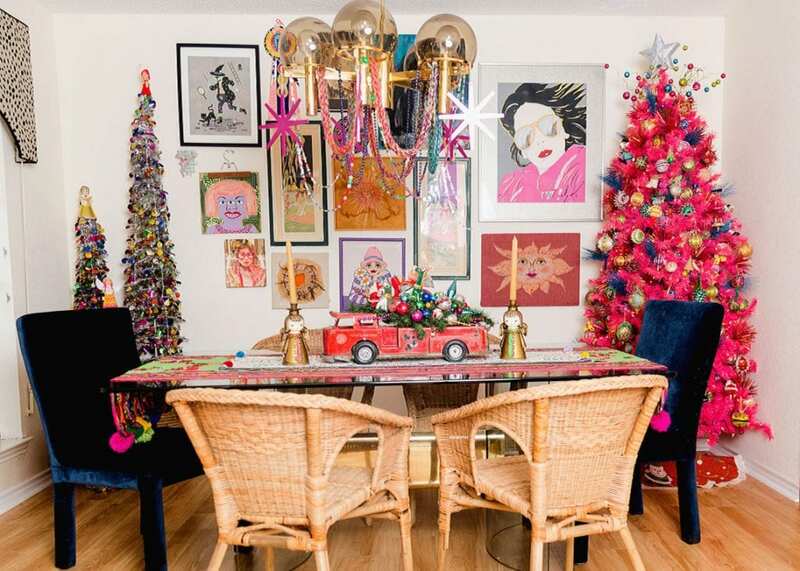 I’ve rounded up a few of my favorite pink Christmas trees if you are looking for more pink tree inspiration! 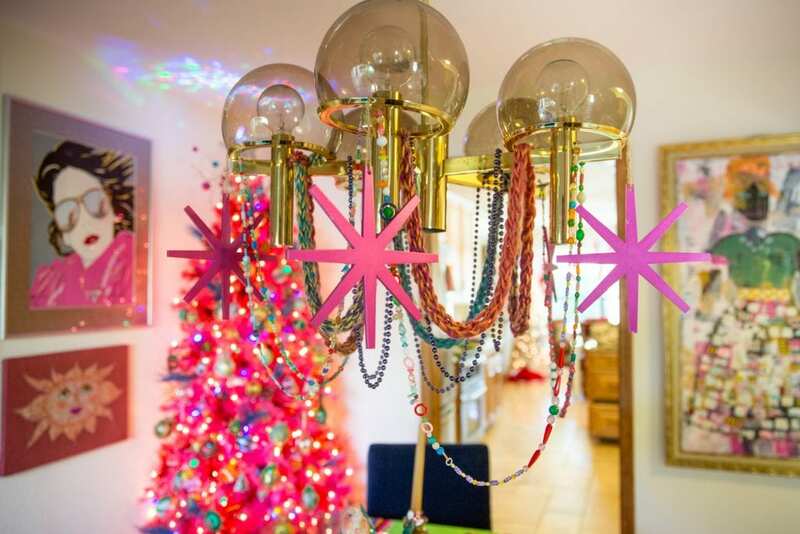 One of my favorite unexpected places to spread the eclectic boho Christmas decor to are my light fixtures. The vintage brass lightolier over my dining room table always gets some special holiday love. This year ornaments, vintage necklaces, Christmas beads and a finger knit garlands hang from the light. Learn how to finger knit your own garland over on DIY Network. I adore vintage beaded Christmas ornaments. They are just the right combination of tacky, sparkle and meticulous handiwork. Most of mine are vintage that I’ve collected through the years, but you’re in luck I also have a tutorial for making your own DIY Vintage Inspired Sequined Ornament. Well except for maybe me. This corner shelf is a bit beat up, but I still love it. The wooden shelf is always changing with the holidays as is the mini gallery wall next to it. Vintage holiday mugs and planters hold a forest of colorful Christmas trees and a small collection of mid-century Christmas finials. These tree toppers were built to catch the light and boy do they ever. My collection is small but mighty. All month long I’ll be sharing a different room tour every week! Posted November 26, 2018 & filed under Christmas, Holidays. Thank you Linda! Maybe I will actually eat dinner in there this year.